In my previous post, I showed you sources and sites for finding educational apps for your iPad or iPhone. In this issue we take a look at tools and techniques for finding any kind of app. We begin with tips for searching the Apple App Store, then move on to less well known but effective methods for finding the apps you want or want to know more about. Apple recently improved the search function on the App Store. Searches now bring up more relevant results by using a wider array of keywords matches. App developers include keywords when listing apps in the store. Apple’s search tool includes these keywords but also employs partial keyword matches and contextual clues when showing you results. That is, it goes beyond the keywords the author chose and the ones you enter to identify relevant results. You can help by taking a moment to consider the best words or phrases you will use before beginning your hunt. Then, spend a minute more on alternative or similar ways to express the same idea. For example, with the holidays just ahead, you may have family or friends arriving by plane. So you’re looking for a way to track their flight in real time, to see where they are in the air. You’ll discover that “track flights” and “flight tracker” will give you very different results. Note the space before the search terms. 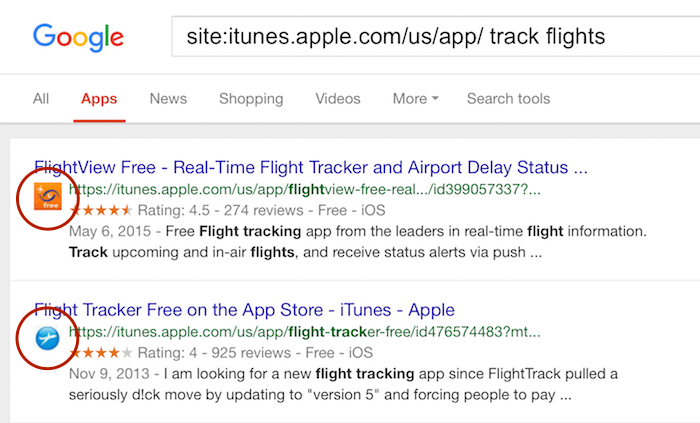 Also note that placing search terms within quotes as in “track flights” will alter the set of results, by telling Google to use a phrase rather than just two words. The /us limits the search to the U.S. store. Here’s a list of other store territories. In Safari on your iPhone or iPad, look for the tabs just above the results list. The last button labeled SEARCH offers you the option to further refine your search by posting date. Tap ANY TIME to choose a time frame. You can use this to adjust results for recently updated apps, a good sign the app author is actively improving the app. Don’t know the exact name of the app but recognize the icon image? Tap the APPS button to add the icons to the apps list. Another way to locate apps of interest is through web-based tools specifically designed for that purpose. 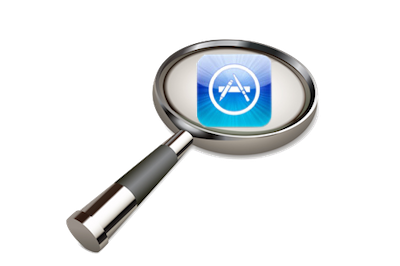 Appcrawlr by Softonic offers a handy search bar at the top of the screen, the ability to search for iPad, iPhone or both, as well as a comprehensive set of filters to refine your search. Another website that can search the app store is Vionza. With Vionza you first enter your keywords or phrase. After the results appear, you can narrow your search using filters found in the left column, including price and store rating.